You can view the menu here before purchasing your ticket. After purchasing your ticket you will be taken to the menu seletion page to complete your menu choices. 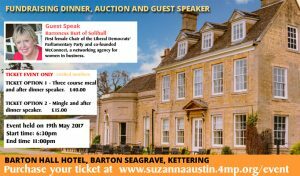 Exclusive fundraising evening being hosted by Kettering Liberal Democrats set in a beautiful period 3* hotel and Vines restaurant and bar. 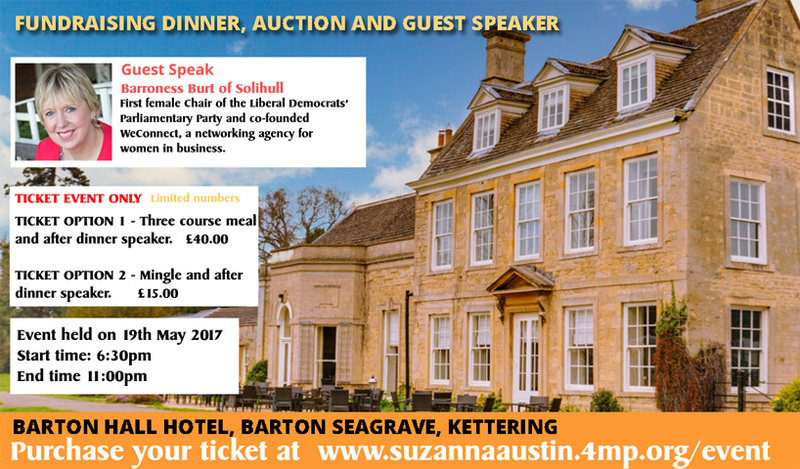 Over the course of the evening guest will have an opportunity to talk to the Parliamentary candidates from across the county of Northamptonshire whilst enjoying a three course meal. One the major highlights of the evening is our after dinner guest speaker which we are absolutely delighted to annouce is Baroness Burt of Solihull. She was the first female Chair of the Liberal Democrats’ Parliamentary Party and co-founded WeConnect, a networking agency for women in business. With her vast experiances from being the Parliamentary Private Secretary to Chief Secretary to the Treasury to being a strong successfully campaigning on important issues including the NHS, Lorely’s speach is going to be an interesting one. There will also be a silent auction with loads of interesting and special one off lots. For those not able to make teh evening you can still bid prior to the night by going to our online auction page, register and bid. If you do decide to bid and can’t make it, thank you in advance as it means a big deal to us. On the night we have a star live auction for a mounted boxing glove by no other than the world heavyweight champion Anthony Joshua. If you would like to place a bid on this item please contact us with your best offer.